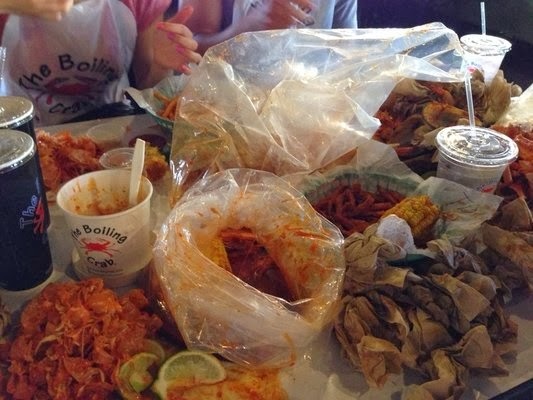 My friends took my boyfriend and I out for dinner at the Boiling Crab this past week. It truly is a dining experience. I went straight from work, still in my work clothes (big mistake), and got ready for the feast of a lifetime. I highly recommend wearing clothes you don't care about it..or maybe I just spill a lot. Somehow I managed to spill on myself and my boyfriend in about 10 minutes. 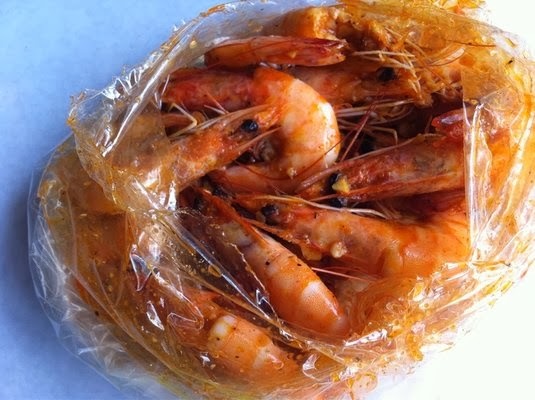 The Boiling Crab is the OC's version of a crab bake. The tables are lined with butcher paper and the food comes in plastic bags. You order different dishes by the pound or can order something called the shebang which is a mixture of them all. We ordered shrimp, crawfish, catfish, sweet potato fries, cajun fries, corn and king crab. It was a good variety of what they offer, and I got to try a little of everything. The point is to share food here people, so if you can't dig into your friends bag of fish then don't go here. Everything was super hot, and very fresh. I loved the fries of course, but the shrimp was my favorite. I actually have never had crab before, so that was fun to try and I really liked it. 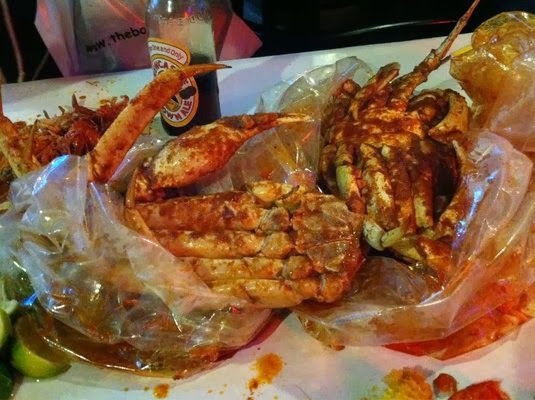 We got a whole crab so I got to try both crab legs and meat. My boyfriend's favorite dish was the catfish. It was a bit too fishy for me, so he got my extra share. Labels: Best of Series, Best Seafood, Santa Ana, What's for Dinner? You totally should go! It is really fun. 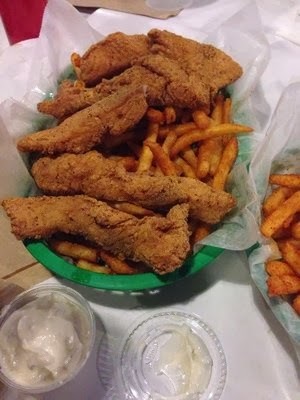 And I bet Mason would love to see all the fish (don't worry there are chicken tenders for the little ones)! You definitely smell afterwards but its a fun, different kind of experience.